Dr. Breit completed his residency in ophthalmology at Washington University/Barnes-Jewish Hospital in 2006. He served as Chief Resident the following year where he was the Attending Surgeon of the University Eye Service at Barnes-Jewish Hospital. Dr. Breit is a graduate of the Ohio State University College of Medicine, where he was inducted into the Alpha Omega Alpha Honor Society. Dr. Breit completed his bachelor's degree in Biomedical Engineering at Duke University. Dr. Breit is Clinical Instructor of Ophthalmology at Washington University School of Medicine. He is a Board Certified ophthalmologist by the American Board of Ophthalmology, a Fellow of the American Academy of Ophthalmology, and a member of the American Society of Cataract and Refractive Surgery. Dr. La Point graduated with honors from Missouri State University and received his doctorate from University of Missouri-St. Louis College of Optometry. Dr. La Point went on to perform clinical externships at Washington University School of Medicine, the University of Missouri-St. Louis Community Service Clinics, and the United States Marine Corps. Dr. La Point is a member of the Missouri Optometric Association, St. Louis Optometric Association, and the American Optometric Association. Dr. La Point is also a Clinical Examiner for the National Board of Examiners in Optometry. Dr. La Point is native St. Louisan who comes from a long line of eye care providers. He has a keen interest in comprehensive eye health management, specialty contact lens fitting, and full scope surgical co-management. Dr. Kadlec earned her Bachelor of Science degree in biology and chemistry from Southeast Missouri State University, where she belonged to the Beta Beta Beta National Honor Society. Later she obtained her doctorate with honors from the University of Missouri-St. Louis College of Optometry. Dr. Kadlec is also a long-standing member of the St. Louis Optometric Society. She enjoys volunteering as a mentor to young women seeking careers in STEM fields through a program sponsored by Microsoft and the St. Louis Science Center. In addition, several magazines and other publications have sought her expertise on articles pertaining to the eye. Dr. Kadlec specializes in comprehensive eye examinations for children and adults, and takes pride in providing a personalized approach to each patient's eye care. She has extensive experience in the diagnosis and management of ocular disease and has received recognition for her skills in contact lens fitting. Dr. Kadlec has a special interest in co-managing LASIK surgery and providing pre-operative consultation to patients considering LASER Vision Correction. Dr. Council earned his undergraduate degree in Forensic Science at the University of Mississippi and received his medical degree from Washington University School of Medicine. He interned at St. John’s Mercy Medical Center and, in 2008, he completed his residency at Washington University Department of Ophthalmology & Visual Sciences. Dr. Council stayed with the Department an additional year to complete a clinical fellowship in Cornea and External Disease. Dr. Council has a special interest in corneal infections and cancers of the ocular surface. A skilled surgeon, he performs complex corneal procedures, including transplants. 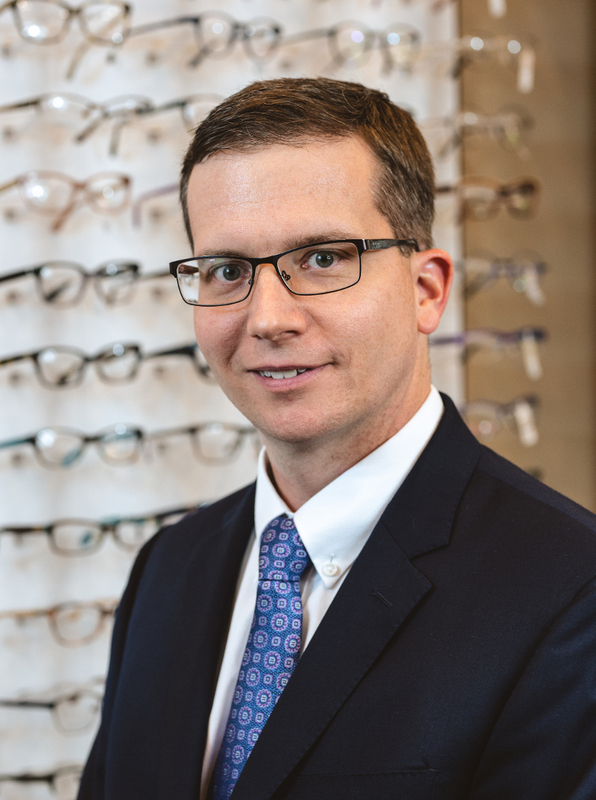 Prior to joining our practice, he was an Assistant Professor of Ophthalmology at St. Louis University School of Medicine where, in 2017, he was awarded "Teacher of the Year." Dr. Council is a past president of the St. Louis Ophthalmological Society and has been Board Certified by the American Board of Ophthalmology since 2010. He is a Fellow of the American Academy of Ophthalmology, a member of the American Society of Cataract and Refractive Surgery, and a member of the Missouri Society of Eye Physicians and Surgeons. Dr. Wexler graduated from the University of Michigan with distinction. He received his medical degree from University of Michigan Medical School. Dr. Wexler performed his Internship at the Henry Ford Hospital in Detroit, Michigan and his Residency at the University of Wisconsin Department of Ophthalmology and Visual Sciences. Dr. Wexler began studying refractive surgery in the 80's and is now one of the most experienced refractive surgeons in the Midwest, having performed more then 60,000 LASIK procedures. Today, he is recognized as an expert in the field, speaks extensively on the subject and proudly serves on an advisory panel comprised of the nation's leading refractive surgeons. Dr. Wexler is Board Certified by the American Board of Ophthalmology, a Fellow of the American Academy of Ophthalmology as well as a member of the American Society of Cataract and Refractive Surgery, International Society of Refractive Surgery, and the St. Louis Ophthalmological Society. Dr. Wexler is Professor of Clinical Ophthalmology at Washington University School of Medicine and Medical Director of TLC Laser Eye Center, St. Louis. Eye Care Associates of St. Louis history and goals. Our practice was founded in 1894 by the eminent Henry Wolfner, M.D., and we have maintained a respected presence in the St. Louis community ever since. Today, Eye Care Associates of St. Louis continues to provide comprehensive ophthalmologic services for people of all ages. Carrying on a tradition that extends back more than a century, Eye Care Associates of St. Louis features an experienced, knowledgeable team of professionals who are strongly committed to providing our patients with state-of-the-art medical and surgical care.